Submitted Photo Bruce Eames of Houston, center, owner of Lope’s Hope 3rd, holds the Gold Lindy Award trophy. Aaron Prince, of AirCorps Aviation, holds the Golden Wrench Award. Others in the photo include Eric Trueblood, third from right, a native of Minot and co-owner of AirCorps Aviation, and Warren Pietsch, sixth from left (in back), chief pilot from Minot of Lope’s Hope 3rd. They are shown at EAA AirVenture Oshkosh when the awards were presented last month. A P-51C warbird, with its home at the Dakota Territory Air Museum in Minot, won top awards last month at the 2018 EAA AirVenture Oshkosh, the largest gathering of aviation enthusiasts held annually at Oshkosh, Wis.
Bruce Eames of Houston, owner of Lope’s Hope 3rd, was presented the Gold Lindy Award in the Warbird category. The award is named after legendary aviator Charles Lindbergh and presented to only the best of the best. The award is recognized worldwide as the ultimate recognition of aircraft craftsmanship. AirCorps Aviation, a Bemidji, Minn., company co-owned by Eric Trueblood, a native of Minot, received the Golden Wrench Award. The award is for the “highest achievement in craftsmanship & dedication in the preservation of aviation history” accomplished in the restoration of Lope’s Hope 3rd. “I grew up in the age when everybody’s father had been in WWII so I spent a lot of time hearing the stories and building models of warbirds,” said Eames, in an email to the Minot Daily News. “I never thought that one day I would be successful enough in business to have the resources to restore the real planes and become a steward of the history they represent. This is the part of bringing back these old warbirds that I love the most, the stories of the men that flew them and the inspiration that they still provide today. This is also why I am so enthusiastic about supporting the Dakota Territory Air Museum. They do a great job of not only preserving the history of aviation but also providing education and inspiration to young people. It is a real asset to the community. Eloise Ogden/MDN Lope’s Hope 3rd, a plane owned by Bruce Eames of Houston and restored by AirCorps Aviation of Bemidji, Minn., is shown at the Dakota Territory Air Museum in Minot. Eames and AirCorps Aviation won top honors for the restoration of the plane at EAA AirVenture Oshkosh last month. Trueblood said it was “a very proud moment” for the AirCorps Aviation team, Eames, Pietsch and the Minot air museum to win the awards at EAA AirVenture. Pietsch, a Minot pilot, is chief pilot of Eames’ warbirds including Lope’s Hope 3rd and also maintains them. “Having an aircraft awarded Grand Champion at EAA AirVenture is the highest recognition for aircraft restoration in the world,” said Trueblood. “This year a record number of world class restorations were judged, so to receive the top award is humbling for our dedicated and talented team. As restorers we have a propensity to focus on the technical side of the aircraft scrutinizing every mechanical and restoration detail. “Bruce Eames and Warren Pietsch are always cognizant and remind us that people flew, maintained, and assembled these aircraft, and honoring their service and sacrifice is of utmost importance as well. 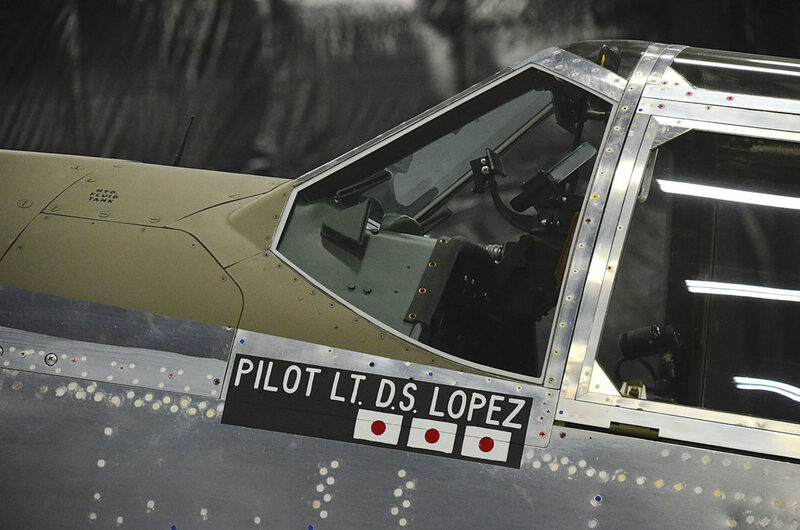 What was heartwarming for me while showcasing the aircraft was to have people in tears come up to the aircraft and regale stories of their friend, co-worker or mentor WWII Ace Don Lopez Sr., who piloted Lope’s Hope 3rd over China. Don Lopez is no longer with us, having passed away in 2008, but we all came a little closer to knowing him by hearing stories from those he meant so much to. Don Lopez Sr. was in Minot for the dedication of the Oswin “Moose” Elker Hangar at the Minot air museum. He flew with Elker, of Surrey, in the “Flying Tigers” 75th Fighter Group. Eloise Ogden/MDN Lope’s Hope 3rd was named for Don Lopez Sr., World War II ace who flew the original Lope’s Hope 3rd, and later became the deputy deputy director of the Smithsonian’s National Air and Space Museum in Washington, D.C.
Trueblood is co-owner with three other partners, Erik Hokuf, Dan Matejcek and Mark Tisler, in AirCorps Aviation, a company specializing in the restoration, maintenance and rebuilding of World War II aircraft for clients around the globe. 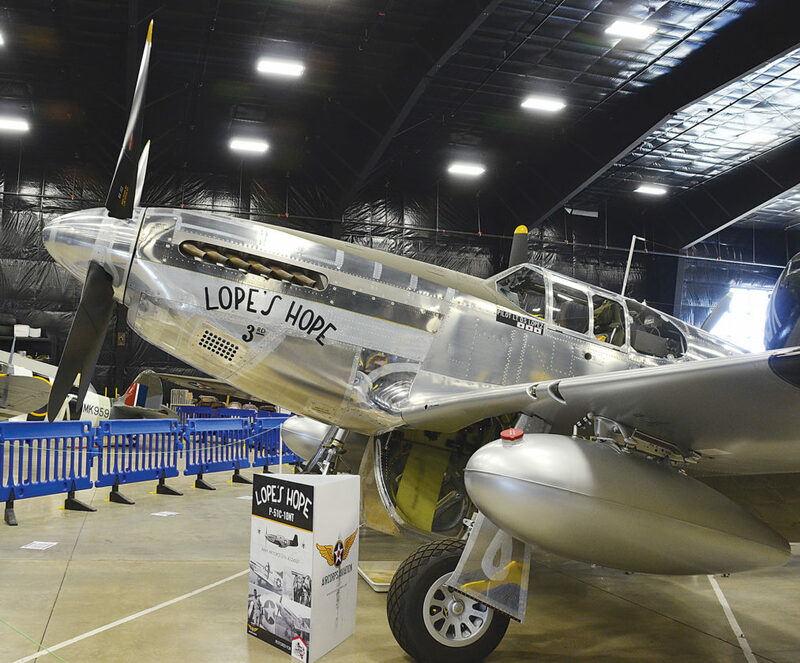 Lope’s Hope 3rd can be seen at the Minot air museum. Submitted Photo Airman Caleb Hanley of Minot Air Force Base has invited, via a YouTube video, R&B singer Brandy to the Air Force Ball at the Minot base. The Air Force Ball will be held there Sept. 15.